I tend to like things clean and organized. (Have I ever mentioned that before?) Disorganization stresses me out. Don't get me wrong. This doesn't mean my house is all put together. Not even close. I just don't like it. But, when I look at the clutter created by my toddler, different feelings are stirred up. Admiration, love, appreciation. It is apparent in many areas of my home that I have a little one running around, and for that I am tremendously blessed. My own headboard is strewn with uneven stacks of children's books. She'll pull them down, looking for one in particular in the seemingly large selection which has actually been exhausted by repetitious snuggle sessions. With her choice, the rest will be plunked back in piles that threaten to topple onto sleeping heads. Their presence shows her devotion and her attentive curiosity. A kaleidoscopic pile of hair clips tends to build up on the shelf next to the tub. They seem to add enthusiasm to the relaxing candles and the unpretentious black clock, and they remind me that I have a healthy girl with beautiful, wavy hair. An untidy pile of toys lines the tub. They contrast with the smooth marble and the shimmering vase in the corner with its elegant feathers and dried branches, but they add an atmosphere of exuberant joy. The bath isn't just to unwind or remove grime. It's to splash, and to hide the boat in the bubbles and balance duckies on a floating tray. The window in the hallway is lined with musical stuffies and random shoes. I dislike objects sitting in this window, as you can see from outside, but it reminds me of her busyness and her exploration. She likes to autonomously switch her Dora slippers for a pair of crocs or rubber boots and run around the house. At the beginning of the hallway she has her own little kitchen set with a fridge, sink, stove, oven, microwave, dishwasher. Even though the food and dishes are consistently put away, other applicable objects get stacked on top. Like a sectional tray. Or a set of scoops. Or a dustpan and broom. She has an adorable desire to do just what we are doing. She loves to pick up a plate and take our order. "What for would you like, Mommy?" The corner of our kitchen acquires more and more activity supplies. Coloring books and crayons. Paint and brushes. Stickers and paper. Glitter glue. Chalk. As I sort through my mail I can glance over and dreamily look forward to her discovering what she can do with different materials as her dexterity progresses and her attention span strengthens. The dining room table always seems to have something set aside for continued play another day. Now, a bag of craft supplies waits to be dumped out and examined. The beads have been taken out and stirred and sorted and threaded, arranged into happy faces, and painstakingly returned to the bag tiny handful by tiny handful. Eventually, the craft bag will move to a more permanent home, only to be replaced by another distraction that I'll regret leaving there when I have to tell her that she can't play with it while we're eating. She is so observant and communicative. 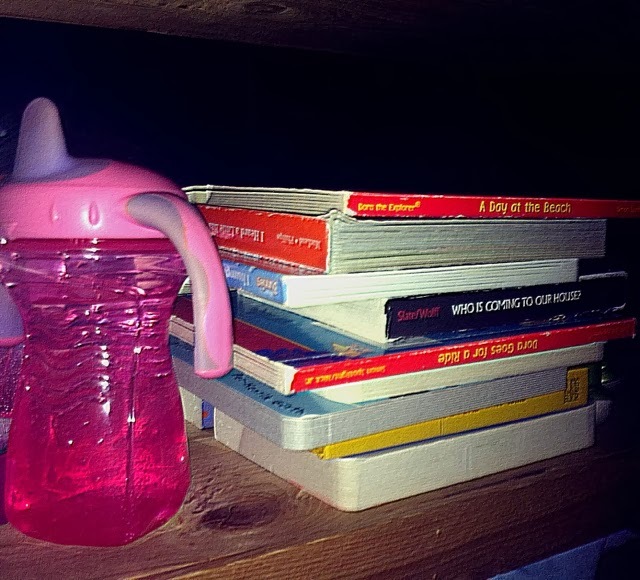 Random shelves are littered with board books and tea sets, stuffed creatures and wooden barn animals, plastic tools and miniature musical instruments. Every once in a while I do a walk through and put stuff back in her room and tell myself to get rid of anything she doesn't treasure. I usually only remove an item or two as I can fondly recall her dancing around the room or sitting quietly, enjoying each toy. Full of imagination, she often pretends random objects are food she insists we eat or they are beds for her favorite dolls. The living room is usuallt littered with blankets of all sizes. Fort covers. Peek-a-boo enablers. Stuffed animal swaddles. Flowing capes. Make-shift beds. Dark caves. Monster-free sanctuaries... I often have to shoo away a dog who takes every blanket dropped as an invite to get cozy. And once in a while there will be a toddler's request to snuggle on the couch. As I clean up I toss the collection into a pile or over the back of the furniture and they wait for their next assignment from their whimsical master. My heart sighs in contentment at the evidence of her play. I try to think of my husband's messes with the same adoration or commendation. I try to appreciate the sawdust in the bedroom or the tools on the porch for the employment he has and enjoys. It helps a little. But maybe it's knowing my daughter is growing so fast and her fancies will progress so quickly. Whereas her father's belongings seem to struggle finding their home the same as they did nine years ago. Thank God for them both.